Amanda Farbstein, Valerie Fachman, Eric Reid. Amanda Farbstein, Valerie Fachman, Eric Reid, Gianna DiGregorio Rivera, David Schiller. Baby you can drive my car; and maybe I’ll love you,” from The Beatles Drive My Car, by John Lennon and Paul McCartney. One of society’s ugly skeletons in the closet has emerged recently with great force and candor – the sexual molestation of children. Prevalent disclosures have revealed the serial abusers who take advantage of their authoritative positions with many minors – priests and officials in athletic programs at schools in particular. Fortunately, as one victim after another reveals their frightening experiences, others seize the courage to join the chorus. 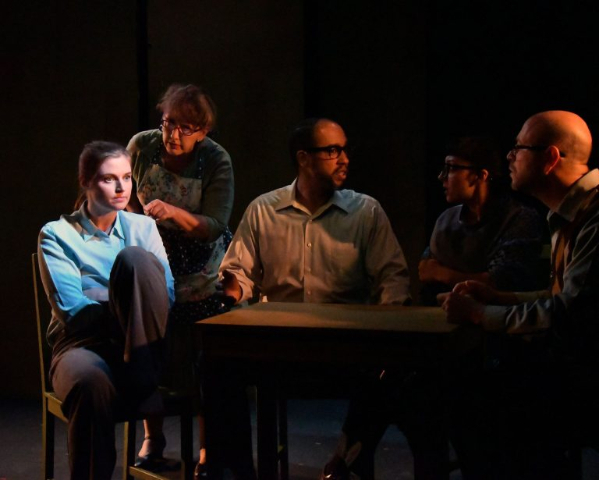 This production that delves into molestation is a worthy realization of Paula Vogel’s Pulitzer Prize winning and otherwise highly decorated play, How I Learned to Drive. The scenario begins in the 1960s, an era when admission by a victim of having been abused would stain the reputation of the victim and perhaps not be believed. It deals with an isolated victim who would have no thoughts of there being other victims by the same perpetrator. The story of Li’l Bit unfolds in a non-linear, but clearly demarcated fashion, from the character’s eleventh year until she is 35. Her name is suggestive of the kind of background she comes from, in which family members have nicknames with sexual connotations. The central story concerns her furtive relationship with Peck, her uncle by marriage. This is not a typical story of abuse but rather a complex interplay between two damaged people, and it holds some surprises both in terms of events and characterizations. Peck is in a childless and perhaps loveless marriage. Gentle, methodical, and somewhat morose, he refuses to talk about his wartime experience in the Marines. Is he repressing ugly memories? Does he suffer from post-traumatic stress syndrome? Clearly, he is an adult who crosses boundaries, but he is drawn by a perverse, yet seemingly genuine affection for Li’l Bit. In some respects Peck is very careful and calculating, but in more ways than one, it is questionable what kind of control he exercises over the events of his life. Li’l Bit doesn’t seem to fit in. At constant odds with her family and the outside world, she fails to stay focused on goals or personal relationships. But was she drawn to her forbidden relationship because she already suffered these social flaws, or was the involvement with Peck the cause of her disconnections? Amanda Farbstein is simply superb in the lead role. She wonderfully captures the nuances of Li’l Bit’s angst and tribulations through the years of growth and change, as well as her sometimes intoxication, rage, and misguided expressions of determination to master her own situation. Eric Reid is convincing as Peck. If you’ve ever wondered how a grown man can entice a child into an ongoing, surreptitious relationship, the playwright provides a road map that the actor executes with delicacy that is so effective that it is unsettling. Valerie Fachman, Gianna DiGregorio Rivera, and David Schiller round out the cast with fine portrayals of multiple family members. The title of the play has both figurative and literal meaning, as Uncle Peck does teach Li’l Bit to drive. Many corollaries to driving are used throughout the script. 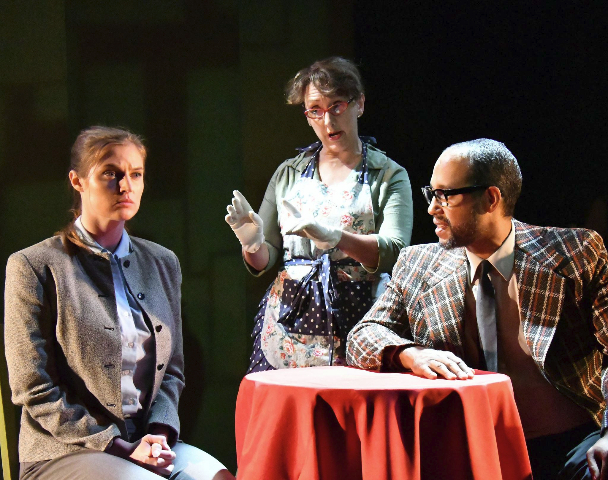 Stage designer Tom O’Brien provides two action loci – the front seats of an automobile on one side of the stage and a table with chairs on the other. 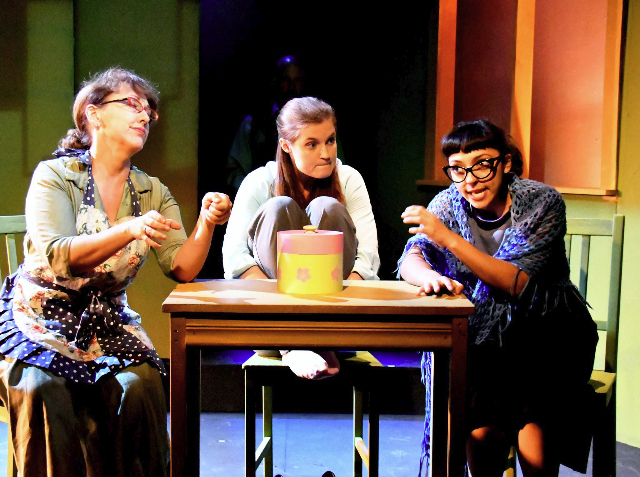 Director Katja Rivera creates an appropriately claustrophobic environment with low lighting and the action kept to the front of the stage in the intimate theater space. Don’t expect to leave How I Learned to Drive with a broad smile on your face or humming the nostalgic period tunes sung a cappella by the cast. But do expect to continue to think about the broader issue that it addresses as well as the particulars of this unusual example. How I Learned to Drive, by Paula Vogel is produced by Custom Made Theatre and plays at their stage at 533 Sutter Street, San Francisco, through October 7, 2017. Posted courtesy of Victor Cordell and For All Events.